I Am Mike D: He Lives! Figures, after I post that I want to do something weekly I disappear for almost a month. No worries, I am fine, just been a bit busier than usual since we last visited. I have re-discovered the great outdoors. Two weeks ago Carrie and I went over to some friends for a BBQ. While shooting the breeze with beers in hand the subject of fishing came up, and how great a childhood memory it was fishing with dad and grandpa. Ian was taking his two young kids up to Lake Kachess in the Cascades the next morning to build some of those memories with them. He invited me along if I wanted to go. Now, I am pretty sure that I haven't been fishing since my scouting days over twenty years ago. (good Lord!) It would have been easy for me to stay in bed, but I thought, what the hell, lets do it. Since his kids were under the age of four and going I figured that I could handle it. He had spare gear that I was able to use. I met up with Ian and the kids early the next morning and we headed into the hills to the lake. After a stop in beautiful Cle Elum for a fishing license we were ready to fish. We drove around the lake a bit looking for a good spot and came across snow still on the roads getting a bit deep for Ians 4-Runner. 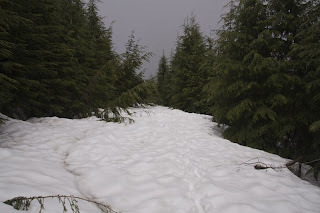 When we turned around there were three guys in a Subaru that was stuck in the same snowfield that we had just cleared. We hooked them up to the 4-Runner with some climbing straps that they had and got them moving again. I was hooked, pun intended. When we got back home I was immediately on the internet looking for my own gear. I ordered a rod and reel, and Last Saturday, my brother Brian and I drove all the way down to the Cabela's Superstore to get me set up. I am ready to roll now and can't wait to get back out there. Last weekend, Ian again called me up and was looking to hike up a mountain looking for a lake that he'd been eying for awhile. He'd never been there, and there wasn't much information on how to get to it. We had us an adventure. I borrowed Brian's GPS, threw some gear in my backpack and we headed out again. The kids didn't come this time. We tried one logging road to get to the lake but it quickly turned into some big puddles that we weren't prepared to drive out of if we got stuck. Up the road a bit was another possible route. It was gated so we put on our packs and started walking. We only walked 2.4 miles in, but it was all up hill and on compact snow. Ian post-holed through a few snow bridges and on the way down I was starting to give him a hard time about it when I had my turn. One second I was upright, the next my head was hitting the snow were my foot used to be. Bam! Oh yeah, that and I was sitting in a small creek with my boots filled with water. It was the last snow bridge that we had to cross on the way back to the truck. One mile of soggy walking and we were done. I was one beat up office chair jockey by the end of the day. Tired, but looking forward to heading out and doing it again. Two weeks, two activities that I haven't done in quite awhile. It was a lot of fun. I look forward to heading out again and actually seeing my first high mountain lake and catching my first fish in years.